Thunder Thursday Moves to The Pike Outlets! Thunder Thursday, the free-to-the-public festival that annually kicks off Toyota Grand Prix of Long Beach weekend, will take place in a new location in 2017: The Pike Outlets on Thursday, April 6. 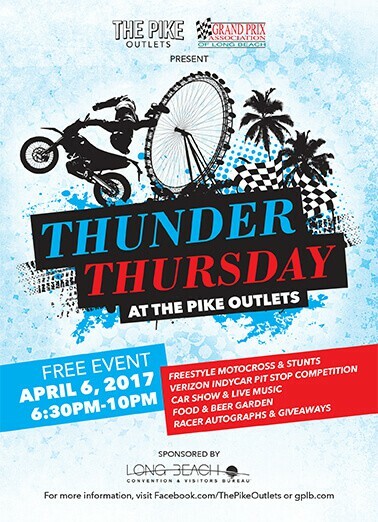 Thunder Thursday at The Pike Outlets will begin at 6:30 p.m. and feature freestyle motocross demonstrations, motorcycle stunts from Tony Carbajal and Verizon IndyCar Series pit stop competitions on Shoreline Drive, west of Pine Ave. Within The Pike Outlets, fans will enjoy live music and DJs in the main Plaza; an exotic, race and classic car show on Bay Street, and a beer garden. Fans will also have the opportunity to get autographs from professional drivers competing at the Grand Prix, see the debut of the 2017 Miss Toyota Grand Prix of Long Beach winners and have a chance to win prizes and special offers with The Pike Outlet’s street team. Parking for Thunder Thursday at The Pike Outlets will be available in the structure at Shoreline Drive and Chestnut Ave. The Toyota Grand Prix of Long Beach will take place April 7-9. The Pike Outlets is a 390,568 sf retail property owned by DDR Corp. in the heart of Downtown Long Beach, California. Located off of Shoreline Drive and Pine Ave, The Pike Outlets is a premiere destination for shopping, dining, and entertainment. The Pike Outlets has a number of great fashion retailers featuring apparel that holds appeal across a wide spectrum of shoppers. The retailers are complemented by restaurants and nightlife options that make the property much more than just a hub of shopping such as a movie theatre, comedy club, and the iconic Ferris Wheel. Formally known as The Pike, the property underwent a redevelopment in 2014 and was rebranded as The Pike Outlets.